Edmonton Puts The Hammer Down! Well, when the Edmonton terminal of Rosenau Transport decides to step up to the plate and do their part for 18 Wheels Of Christmas, they do it in style and size large! Under the watchful eye of the 18 Wheels, Edmonton Coordinator, Jodi Manning, the Edmonton crew has already garnered lots of media interest in their 18 Wheels activities. They have even started receiving financial donations, including a cheque from Wingenback Transport as well as Global Transport and promises for more to come. We cannot overestimate the value of the support that we get from our partners in the Transportation Industry when it comes to the support of such a worthwhile cause. The Edmonton Crew has many collection plans and we will update you has they become solidified, (is that really a word?). December 15th The 18 Wheels crews will be heading out to 3 different Diamond Truck locations to collect the food that this outstanding company is collecting for 18 Wheels. December 16th Delivery Day to the Edmonton Food Bank! We wish Edmonton luck with all their collection efforts and we can't wait to see some pics and hear your stories as these events unfold. Check back often, we will keep you updated! They will be taking donations of food and cash at both locations. All cash donations are used to purchase the often overlooked, but, much needed baby food for the Food Bank. 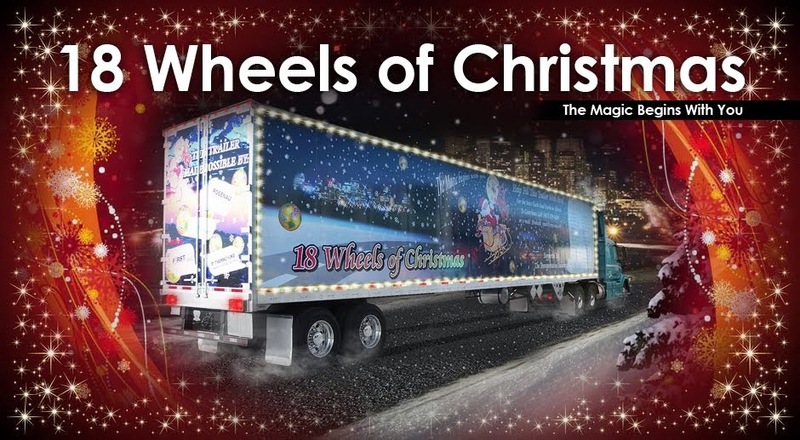 And, just in case you are new to our website and have not had the chance to read about The 18 Wheels Of Christmas campaign, it is important to know that "ALL" donations collected in a community stay in that community. We will keep you posted on the success of these collection days and remember, if you can't be there to help or donate, please, make sure you drop an email to 18wheels_xmas@rosenau.org to find out how you can help make sure that no one goes hungry this holiday season and beyond! A New Year Kicks Off! 18 Wheels is set to roll again! Event planning is underway and we are sure this will be our biggest year yet! Stay tuned to the webpage and we will keep you posted on all the exciting news. And remember, 18 Wheels is nothing without our partners and customers in the Transportation Industry,so please, if you have not already done so, contact us to find out how you can help put food into your local Food Bank!